Delta Activity - "Ill Fated"
Delta Activity plays melodic guitar based rock out of their hometown of San Jose, California. On their promo sheet, they claim influences such as Pink Floyd, Led Zeppelin, and Tortoise (hear the first two somewhat, not sure about the latter). The first two full songs, Planet Tonight Parts 1 and 2 didn't grab me that much, sounding like fairly routine alt rock (though Bugs was a nice, if brief synthesizer intro), but the band starts to catch a little fire with Long Ride, which has some excellent riffing and spacey textures in its first minute, and some kind of cool vocal bits near the end. Catalogue Action is basically a little bit of instrumental lounge jazz, but shows that the guitarist does have some chops up his sleeve. When You Know slips back into fuzzed out alt-rock mode with a nice but somewhat unnecessary piano coda (would have preferred to hear them do a little bit more with that within the song). Along the Way did impress me however, with its moody atmosphere and excellent jazzy guitar work, and was my hands down favourite track on the disc. I have to admit, too, that I liked this one because it was an instrumental. I found Delta Activity's vocalist to have a somewhat thin voice which sounded okay on the softer bits, but didn't fair so well on the louder parts (I think, however, that this is probably just a matter of personal taste). But some of the backing vocalists sound like they should have a chance taking the lead. It was nice to hear the acoustic guitar on the 7-minute album closer What I Want, with some more, jazzy electric guitar, and certainly the best solo on the album. Nice dreamy, soaring coda to the piece, too. In short, I didn't find anything on this album that blew me away in terms of innovation and exploration, but the band does show promise, with some stronger song writing and the willingness to press in a more innovative direction (like their major influences always did) they may have something going for them. For more information you can visit the Delta Activity web site at: http://www.deltaactivity.com. 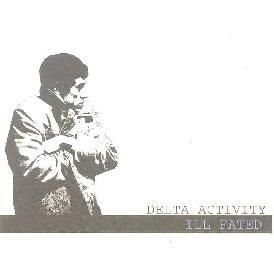 You can purchase Ill Fated online at: http://www.cdbaby.com/deltaactive.